Growing up in Moray, anything that happened South of Aberdeen was a long, long way away. 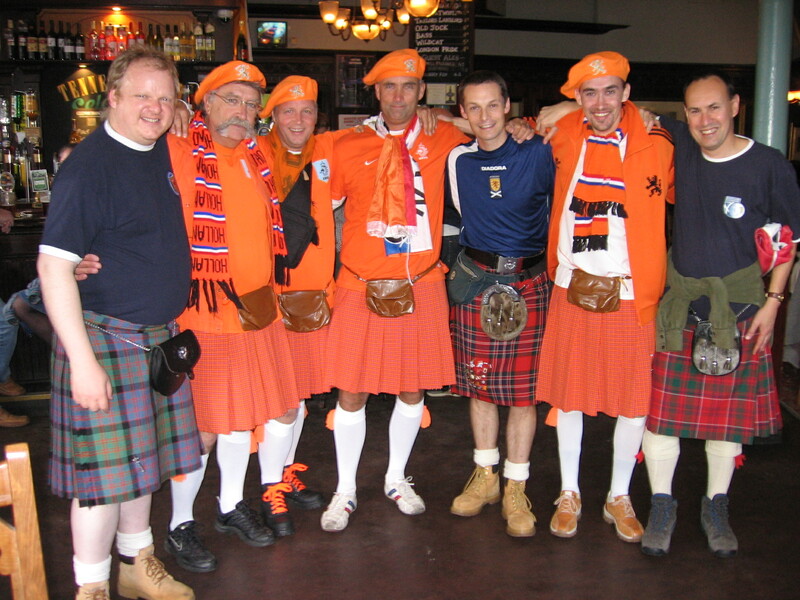 Anything that happened in Glasgow may as well have been in a foreign land – for that’s how Glasgow actually felt to native Doric speakers. They couldn’t understand us, we couldn’t understand them. Foreigners. Consequently, I didn’t see a Scotland game till I was an adult and even that wasn’t in Glasgow. By 1988 I was working in my first job in South West London and the Saturday after being at Wembley to witness Wimbledon’s historic FA Cup win, I was back to see Scotland take on England in the last ever encounter between the countries at Wembley prior to the demise of the Rous Cup – the successor to the Home Internationals. So technically speaking, my first ever Scotland match was an away game. There then followed a hiatus of 6 years by which time I’d moved to Glasgow and started going to Scotland home games regularly. However, regular away games only started for me in 1999 so I still consider myself a newbie. I had joined the Travel Club in 1997 in the hope of getting tickets through the ballot for the World Cup in 1998 to no avail. So my tenure as a TC/SSC member – all 20 years of it – has been one of out and out failure. I’m sure this is a common experience, but it’s only once I started attending away games that I started to make TA friends beyond our immediate group. It was through this that I joined the earliest Tartan Army Board – founded and moderated, I believe, by Scott Kelly. 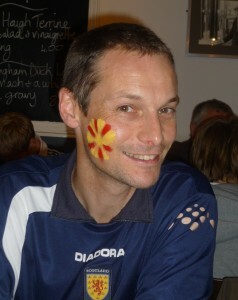 That was the route via which we first heard about Kemal Karic around 2001. You can read about the background to this elsewhere on this site so I won’t repeat it here, but it meant a few of us became involved in fund-raising in order to provide ‘Kemo’ with a prosthetic limb. 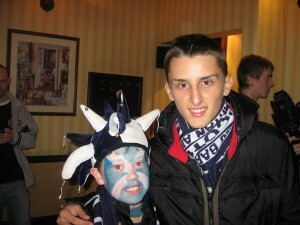 Kemal Karic (aged 15 in 2007) with my nephew, Ross prior to the Italy match. 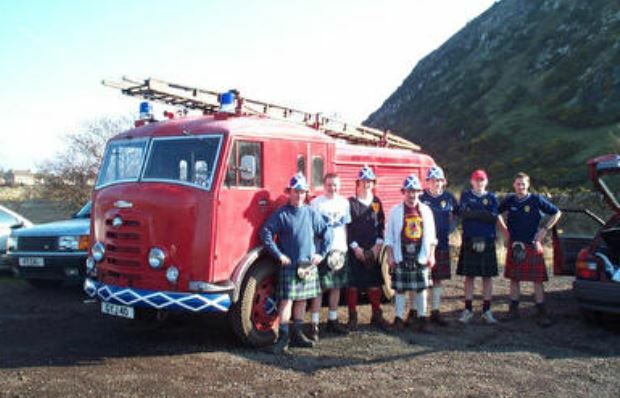 I well remember joining Beast and the Tartan Fire Brigade for a sponsored walk over the Lothian hills. Other efforts included various bucket collections at games and in particular, I recall Ruary McGregor selling a Tartan Army Songbook which proved to be pretty popular. 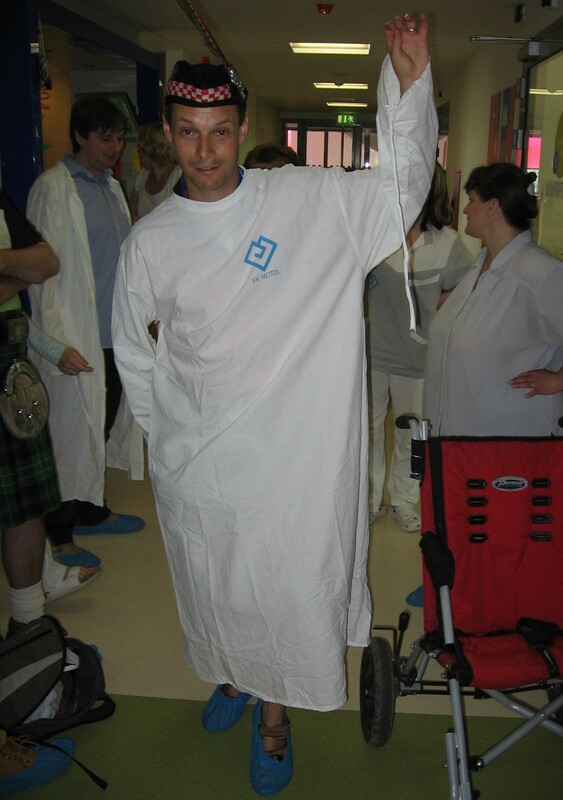 Not as popular of course, as the infamous, personalised TAMB T-shirts which I believe raised the most money of any initiative. There were several batches of these. It is now well documented how all of these fund-raising efforts by a rag-tag bunch ended up raising more money than was required and out of this the Sunshine Appeal was formed. At the start of one of the fund raisers from which TASA was eventually formed – The Lothian Laws Walk. And so the first ever Sunshine Appeal donation took place in Vilnius, Lithuania in 2003. The Steering Group around then, (if indeed it was even known as such at the time), was quite large, and a real group effort was made to supply all sorts of goods rather than money. You can read about the details HERE. Since then, my involvement has waxed and waned over the years according to my available time – which is all that can be expected of volunteers. At times I’ve felt like stepping down when I haven’t been able to do as much as I’ve wanted, although as the only remaining ‘founder’ member of the Steering Group, I’ve found that even in those times I’ll have been able to advise on issues which have stopped us from repeating mistakes. I’ve seen things change a bit since those early days. We used to pride ourselves in not being overly structured, but things are just a lot more efficient when they are organized properly, so these days we have a constitution and roles. 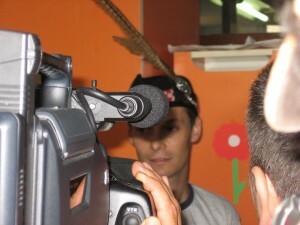 I’ve attended quite a few presentations over the years, but have probably never had a higher profile role than when leading the double presentation during our first trip to Macedonia in 2008. 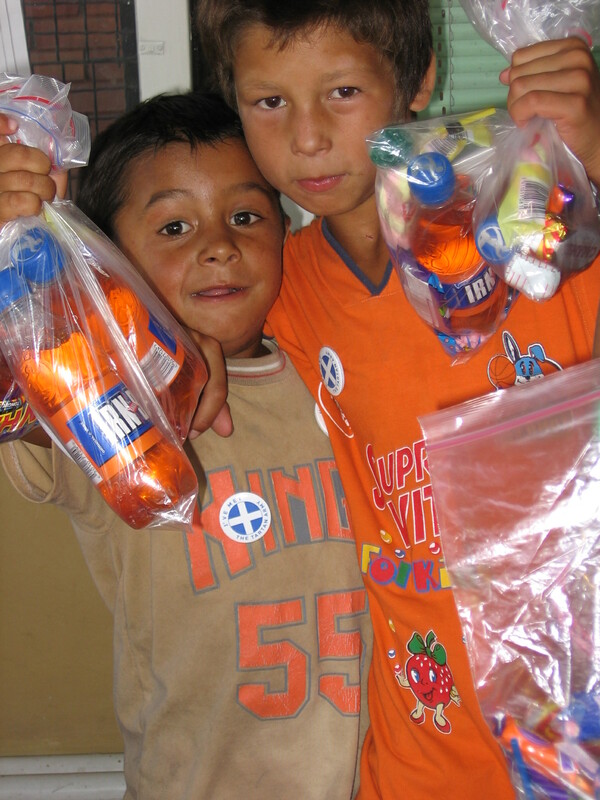 On that occasion, the donations were instigated by Tartan Skopje and the Sunshine Appeal topped up their funding. However, the leader of that organization (a former Sunshine Appeal Steering Group member), didn’t think he’d be able to attend and asked me to be the lead. The first presentation was memorable for a couple of reasons. It was at a day care home for the Roma community in a suburb of Skopje. It would be fair to say that the Roma people were not treated well by the locals in Skopje and the staff in the home said: “It is the first time these children have ever been shown any compassion by anyone”. That’s a pretty special thing to have been involved in. The other reason centred around what happened following my involvement. I had a 5 minute speech roughly prepared in order to describe to the staff who TASA were and what we did. What I didn’t expect was for three TV companies to turn up. The 5 minute speech had to be instantly shortened to 30 seconds which wasn’t easy with three microphones shoved under your nose. It was only later in the day it became apparent what had happened to the footage shot that morning. Locals started to come up to me saying they’d seen me on TV. Apparently the clip of the presentation had been broadcast as part of the Macedonian National News every hour on the hour. Under the spotlight in Skopje, 2008. Last year, about 15 years after my first charity fundraiser for TASA, came my most recent. My main hobby is cycling and I’ve always wanted to see how far I could cycle in a day. That chance came when those two strands of my life came together and I cycled from my home in Glasgow to where I was brought up in Buckie. (Full story here). When I found during that I could cycle 200 miles, it opened up a new aspect of my hobby. My next challenge is to see how far I can cycle in 24 hours and so I am in the early stages of planning a 300 miler. But don’t worry, I’ll not be looking for sponsorship this time. For the last couple of years, my main role on the Steering Group has been to manage the Sunshine Appeal website. With a background in IT, this has proved to be a nice fit and even given me a new skill. No doubt one day I’ll pass on the reigns to some fresh blood. I certainly hope so as that will mean the Sunshine Appeal is still going from strength to strength. But as yet, the desire to be involved and to make a difference is still strong. Getting prepped for being shown round a kids hospital in Prague. 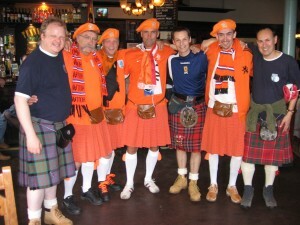 Fraternising prior to the home game against the Dutch in 2009.